By transferring her private foundation to the Oklahoma City Community Foundation, Janet McNutt says she has saved time and money while continuing her parents' charitable legacy. As newlyweds, Janet's parents moved to Oklahoma City in 1932 when Mr. McNutt accepted a position with an insurance company. A graduate of Georgetown University Law School, he would go on to practice bankruptcy and corporate law while his wife remained active volunteering at a local hospital. Although the McNutts eventually moved to Texas, they continued to support nonprofit organizations in Oklahoma City. Upon their deaths, Janet established the Bill and Sally McNutt Foundation to continue their philanthropy. 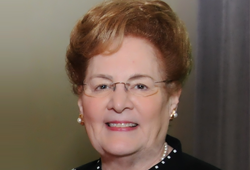 In 2002, tired of the administrative headaches and expenses of operating a private foundation, she transferred the assets to the Oklahoma City Community Foundation to establish an endowment. "The Oklahoma City Community Foundation does all of the work for me and I get to enjoy recommending grants at my convenience," she says. "I no longer have to worry about board meetings or handling investments instead the community foundation does all that." In 2012, Janet decided to establish her own advised fund, the Janet McNutt Foundation, through which she will continue to support the charitable organizations that she believes in. We offer several endowment fund options that provide simpler alternatives to a private foundation. By transferring a private foundation to an endowment at the Oklahoma City Community Foundation, donors can remain involved in grant making decisions and ensure that their charitable intentions are continued in perpetuity. In addition, we handle all administrative and legal requirements and offer greater tax advantages and fewer restrictions than private foundations. To learn more, contact Joe Carter at 405/606-2914.